Sorry, I got my own! Wonder why we make such a big deal about Bringing-Your-own and not using plastic bottled water? Because for us while it’s a simple matter of using a bottle and tossing it in the bin, given the earth’s population and turn this individual act into a global phenomena – the figures are shocking! And take a huge toll on this planet. In a recent feature we explained how Plastic is actually a sustainable material, but it’s us humans who make it criminal, through our careless use. Sometimes sustainability lies in how we use something rather than what we use. We have a special collaboration with Trademachines – who deal with buying & selling of used machinery – explain to us why we need to stop buying bottled water and carry our own. Ditch that bottled water because…. Often you hear the excuse that “I can try however hard I want, it won’t matter, things need to change on a higher level”. While it’s true, that new governmental regulations, for example, might have a greater effect, but if we all lived a more sustainable lifestyle, the issue wouldn’t be so pressing at the moment. Before having experience with them, hearing the terms “sustainable lifestyle” and “green living” we automatically assume that this means life with limitations, lack of comfort and just a lot of work in general. Obviously, vegans or those who live a zero-waste lifestyle put a lot of energy effort into having such a small ecological footprint and set a great example and what they do for our planet is very admirable, but if you can’t imagine yourself being one of them, there’s still a lot you can do. There are numerous easy steps you can take to live a more sustainable lifestyle and to get you started. Avoiding bottled water is one of them. Buying water in the store might be the last thing you’d think of as environmentally harmful, but the following infographic explains why the consumption of bottled water is neither good for the environment nor for you. The U.S has the highest consumption of bottled water in the world even though we are lucky enough to have access to clean tap water. We assume that as long as we recycle the bottles, we aren’t doing much harm, but unfortunately that isn’t true. The plastic bottle you buy is most likely never going to be a bottle again and these are just some of the countless reasons why drinking bottled water is just not worth it. Take a look at the numbers yourself and you’ll realize that bringing your own water bottle is really not such a big sacrifice compared to the positive impact it will have! 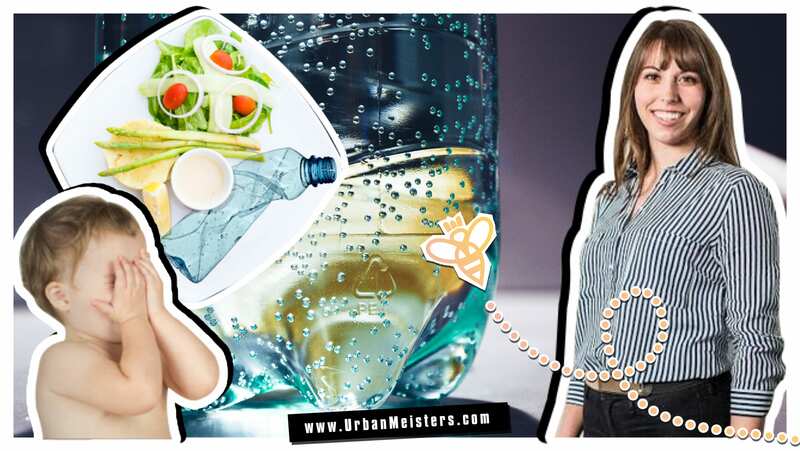 Now that you know why you need to cut down on buying bottled water and avoid that carbon footprint, here are some simple steps to cut down plastic in your life as explained by our founder Mirela! And here’s looking at plastic bottles issue from the safety perspective. Every time you pop open your diet Coca-Cola or Evian bottle, should you be worried? Or are these PET mini wonders all good & clean as the companies claim? Find out below. CONTINUE READING – IS DRINKING OUT OF PLASTIC OK?